National Insurance Company 205 Administrative Officers Recruitment 2017/ National Insurance Company Limited Administrative Officers(AOs) Recruitment released: National Insurance Company Limited has released the NICL recruitment /job notification for Administrative Officer post recruitment. With vacancies of total 205, the online registration will start on 30 March 2017. Candidates with Graduate/Post Graduate degree in any discipline are eligible to apply. The starting basic pay will be Rs. 32795 and the total emoluments will be Rs. 51000 per month. Other benefits such as Pension under New Pension system governed by PFRDA, Gratuity, LTS, Medical Benefits, Group Personal Accident Insurance etc. shall be as per rules. National Insurance Company Limited (NICL) is inviting online application for the 205 Posts of Administrative Officers in Scale – 1 cadre from open market across India. NIC (National Insurance Company Ltd.) is India’s oldest general insurance Company. It was incorporated in Kolkata on 5th December, 1906 to fulfil the nationalist aspiration for Swaraj. 66 years later, after nationalisation it was merged along with 21 foreign and 11 Indian companies to form National Insurance Company Ltd, one of the 4 subsidiaries of the Govt. owned General Insurance Corporation of India. The starting Basic pay would be Rs. 32,795 /- in the scale of Rs. 32795-1610(14)-55335-1745(4)-62315 and such other allowances as may be admissible under the rules in force from time to time in the company.. Total emoluments will be approximately Rs.51,000/- p.m. in Metropolitan Centers. Nationality: Candidates must be a citizen of India or subject of Nepal/ Bhutan or a Tibetan refugee (came over to India before 1 January 1962 with the intention of permanently settling) or a person of Indian origin who has migrated from Pakistan, Burma, Sri Lanka, East African countries of Kenya, Uganda, the United Republic of Tanzania, Zambia, Malawi, Zaire, Ethiopia and Vietnam with the intention of permanently settling in India. Educational Qualification: Candidate must be postgraduate/ graduate degree holder in any discipline with at least 60% marks in either of the degree exam (55% for SC/ ST). The qualification must be obtained from recognized Indian Universities duly approved by the UGC or any of the recognized Indian Institutes duly approved by AICTE. Age: Candidate must be in the age group of 21-30 years as on 1 March 2017. Upper age limit relaxation norms are available to reserved category, Ex-serviceman, ECOs, SSCOs, Defence service personnel and existing employees of public sector general insurance companies. The official notification clearly states that, "Please note that the eligibility criteria specified herein are the basic criteria for applying for the post. At the time of interview the Candidates must necessarily produce the relevant documents in original and a self-attested photocopy in support of their identity and eligibility pertaining to category, nationality, age, educational qualifications etc as indicated in the online application form." Candidates should therefore apply filling the correct information. The examination will be held online; candidates can get details of the exam venue in the respective call letter. Pre exam training will be provided to SC/ST/OBC (Non-Creamy Layer) candidates who wish to avail the benefit of the same. In order to avail this non-residential training, candidates shall have to register their names and other details with the Regional offices of National Insurance Company Limited convenient to them. The selection process will comprise of preliminary exam, main exam and interview. In order to be eligible for online registration, candidates must possess certificate in proof of passing the qualifying examination (as on 20 April 2017). It is important to note that candidates must have at least 60% marks in either of degree exam (55% for SC/ ST). Candidates have to submit their application online along with fee of Rs. 600 (Rs. 100 for candidates belonging to SC/ ST/ PWD category). Application starts from 30 Mar 2017 and ends on 20 Apr 2017. 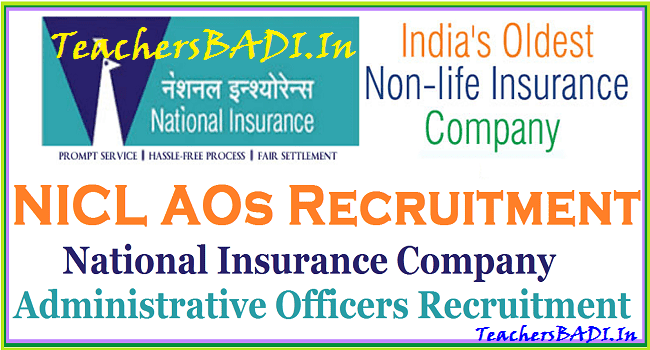 The online registration to begin for National Insurance Company Limited AO Recruitment 2017, job seekers must go through the eligibility criteria properly. Only those candidates who fulfill the conditions set by the recruiting body will be eligible to apply for the job. National Insurance Company Limited has released job advertisement for Administrative Officer (Generalists) Scale 1 post and online registration will begin on 30 March 2017.